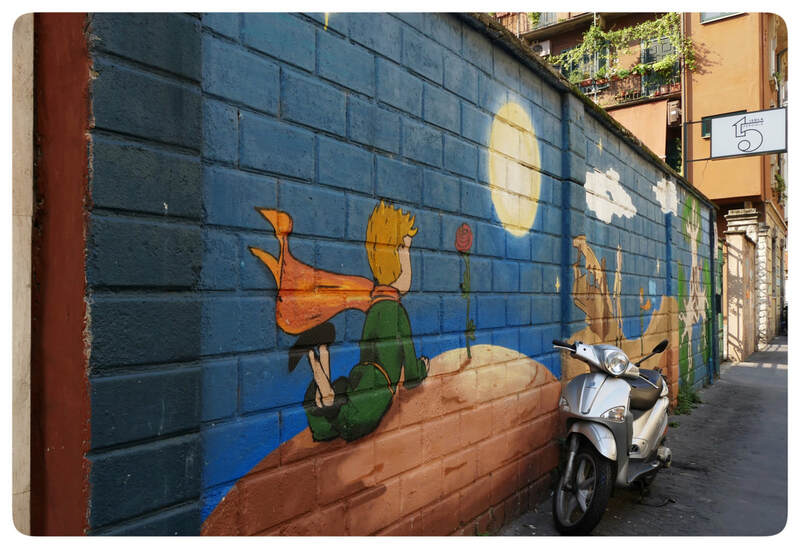 Gelato eating and Street Art hunting in Isola. Favourite? Heading home tomorrow. You are Always in my Prayers. Love Mom. St. Peter’s busy Cathedral in Rome is the home of Michelangelo’s unarguably most famous Pieta. I have seen it—the bodies are beautiful, strong; yet you are convinced Mary is grieving. In the sculpture, which he carved at 25 years of age, Mary holds her son’s body as if it is a precious gift and she seems at terms with her loss. The Rondanini Pieta stands alone in the centre of what was once a hospital in Sforzesco castle in Milan. The work itself is considered unfinished. That in itself tells a story. 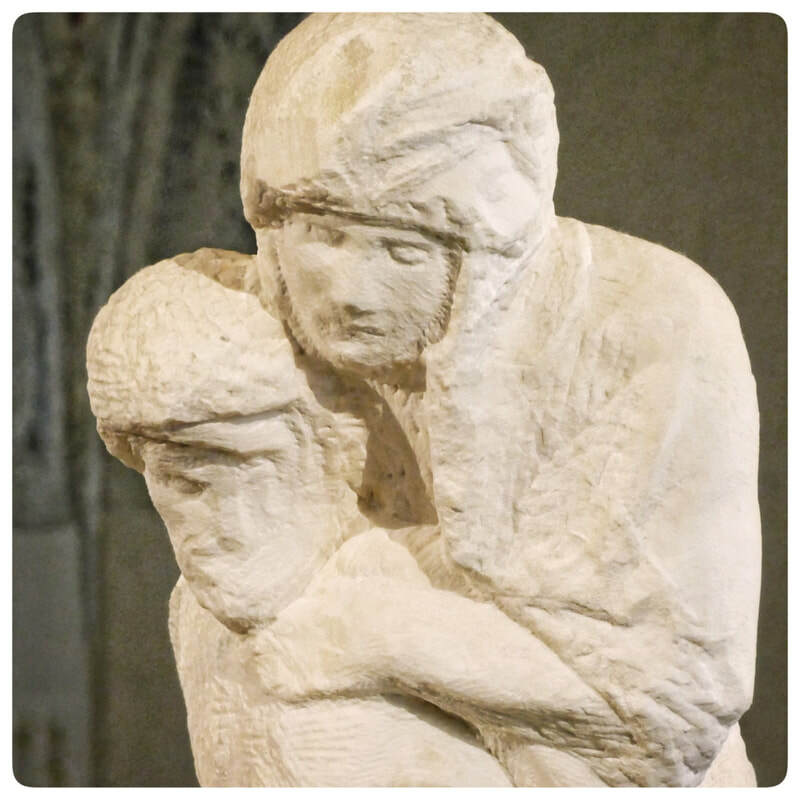 Mary does not so much as support her son’s body as the two bodies entwined support each other. There is so little space between them that there is only room for a slight shadow to fall. The marble is rough as is Mary’s expression of grief. Her face is sad...it says I hurt...I have lost my son...I am still working through my grief. So maybe we should not consider it unfinished but—as some writers say—a work in progress. Michelangelo revised and revised this piece again and again for almost a decade until the story was interrupted by his death. 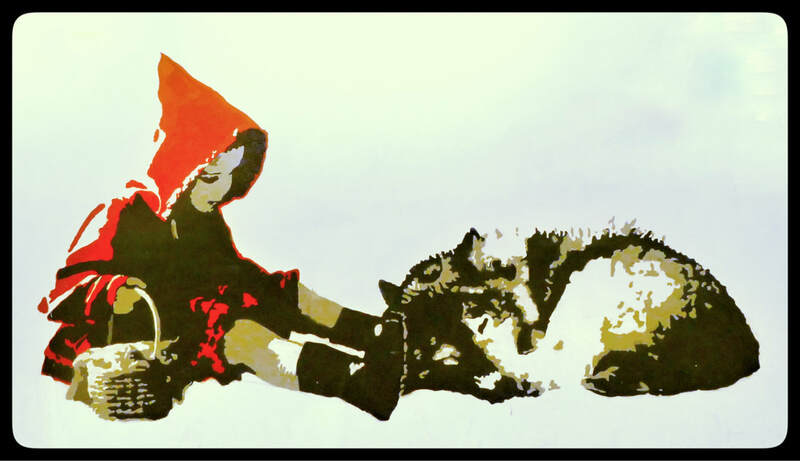 A profound work. How do you even begin to describe a day that sandwiches walking on the roof of the 3rd largest cathedral in Europe between the Last Supper and Opera at Teatro alla Scala. 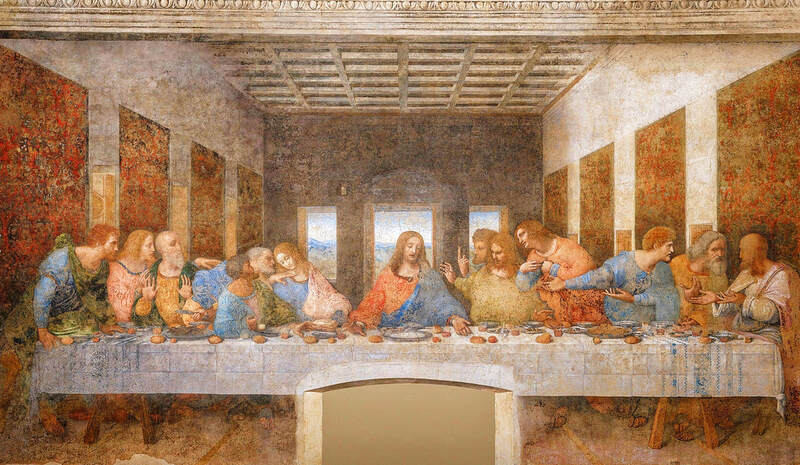 Milan is fabulous—of course we had great gelato—but I think I want to chat about The Last Supper. The Last Super by Leonardo da Vinci is huge—it covers an end wall of the dining hall at the monastery of Santa Maria delle Grazie. It has undergone many restorations since 1498 so, in order to prevent further deterioration photos are forbidden (I have borrowed this photo from their website). Some of the damage is due to expected decay over time...some due to tragic events. In fact when the allies (that’s our side) bombed Milan in 1943 the monastery was hit and if it wasn’t that the Milanese had protected the monastery wall with sandbags this treasure would have been lost . We are fortunate to still be able to enjoy its power. 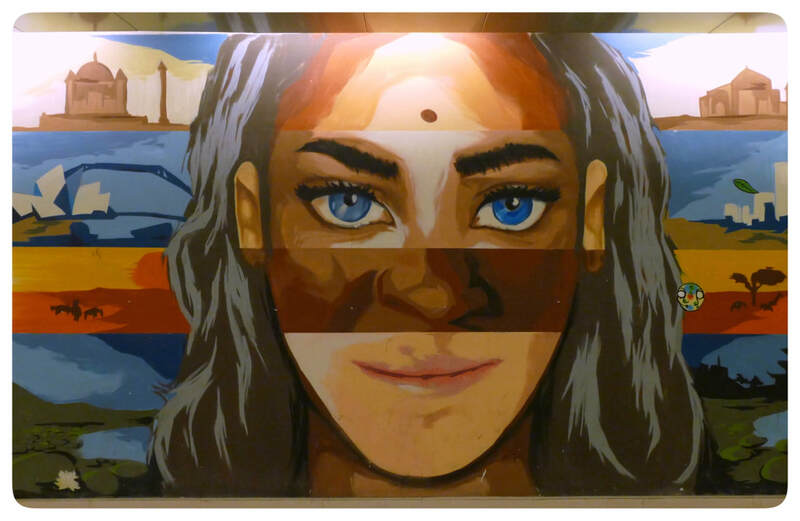 For me the composition is a fairly common theme of faith, but even if that is not where you are at there is so much we can learn from the emotions expressed—for me that was the impact. Can you tell who is going to betray him? Who looks surprised? Angry? Shocked? Whose hand holds the knife—is he the betrayer or does he want to protect Jesus? Twenty minutes with this masterpiece is only enough time to discover you have more questions than answers! So, no hiking or swimming—instead of feeling sorry for ourselves and eating the only food we had left ( cold cereal and no milk) we decided take a train into one of the nearby towns. 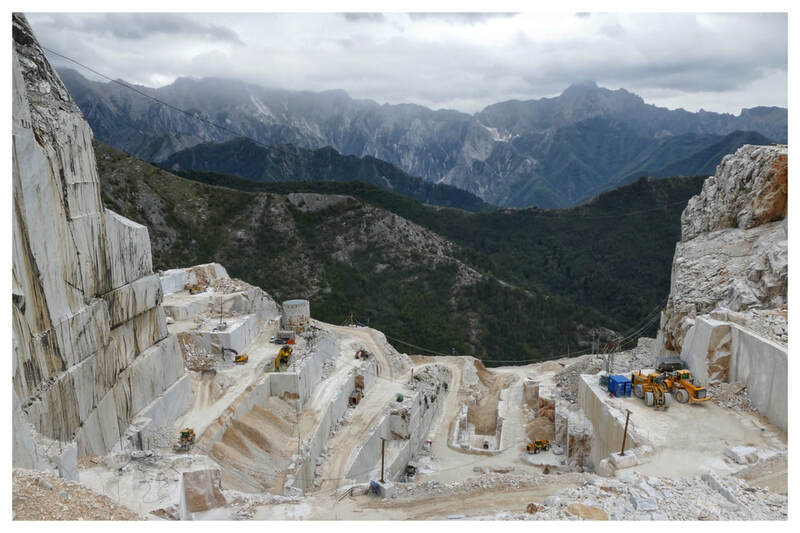 Ever since we learned that Michelangelo personally chose the marble he sculpted from Carrara we have wanted to visit the quarry. It is only 40 km from here—seems easy, right? Well, we took two trains to Carrara and a bus to the central bus station. From there no bus travels into the mountains—oops! Off to the tourist office—closed. By now we have walked miles and are completely lost. Next thought—there’s the Police Station...they will help us! And they did—they were amazing. They got a taxi to pick us up from the station and drive us up the mountain. Now, mind you the taxi driver charged us almost twice what he was supposed to. That took most of our money; so we were going to have to walk all the way down which was about five miles, but we didn’t care because we had seen these amazing Marble Quarries by 4x4. Things just got better and better. A couple of really nice German tourists picked us up part way and dropped us off at a grocery store back in Carrara. We took the train home to Manarola and are enjoying a quiet evening snacking on M&M’s in our comfy little room. Sometimes almost disasters make the best travel stories. You are Always in My Prayers. Love Mom. 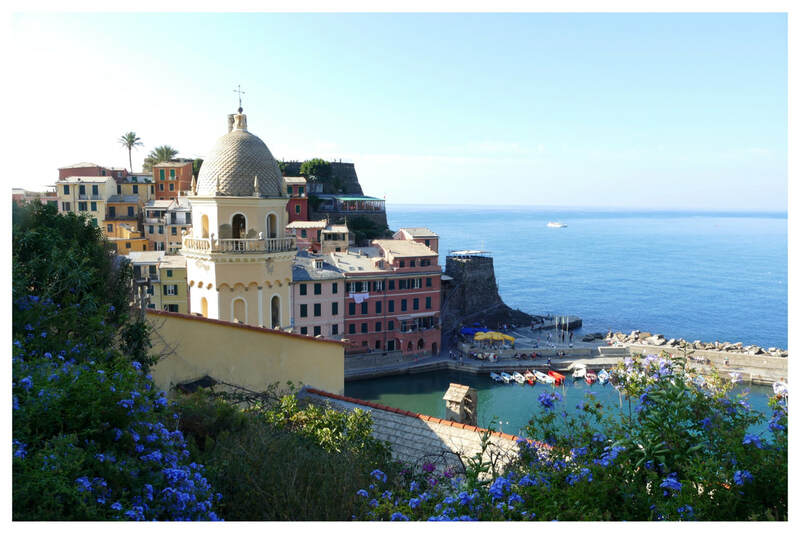 Today we hiked between two very different towns—Vernazza and Monterosso. It wasn’t quite as steep as yesterday, but it was along the cliffs and still fairly challenging. We started in Vernazza which is a small town of about 500 residents. It was hit hard during the 2011 floods and landslides. A pause in the rain allowed many of the residents to escape to higher ground but the damage to property was devastating. Within two years the city had largely been rebuilt with stabilized hillsides and a superior aqueduct system. Just seven years later it is definitely a beautiful place to visit. Monterosso is a much larger town with tons of tourists, and a somewhat sandy beach—I loved the beach after our long hike. 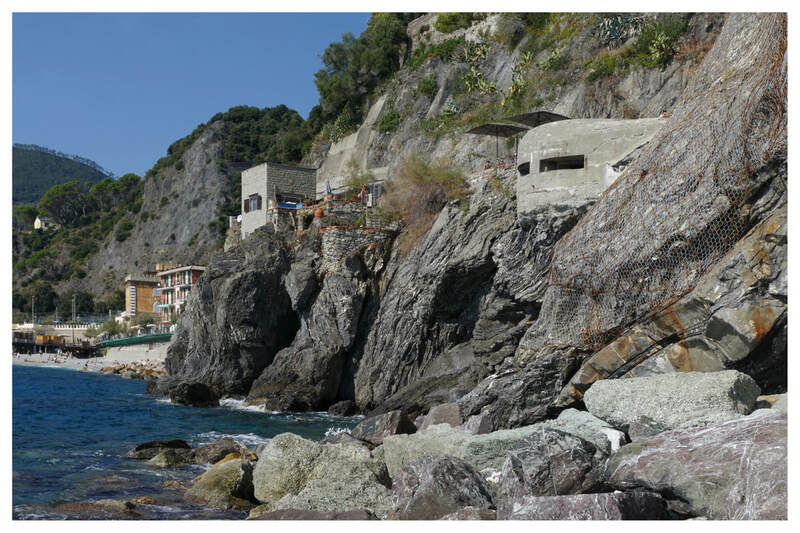 During WWII this Cinque Terre town received quite different visitors than today. In fact two bunkers used by the Nazi’s can still be seen from the breakwater. They provide an interesting contrast to the nearby fancy hotels and restaurants. After our visit we took the ferry back. It was lovely to see the hill towns from the water. I really enjoyed both towns today, but I did have a favourite. Which one would you choose to stay in? 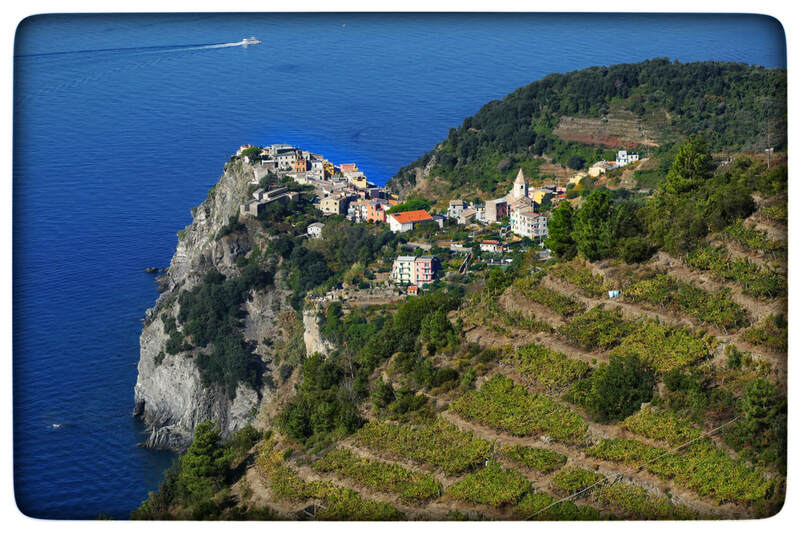 In the corner of the Italian Riviera are five resilient hill towns know as the National Park Cinque Terre. 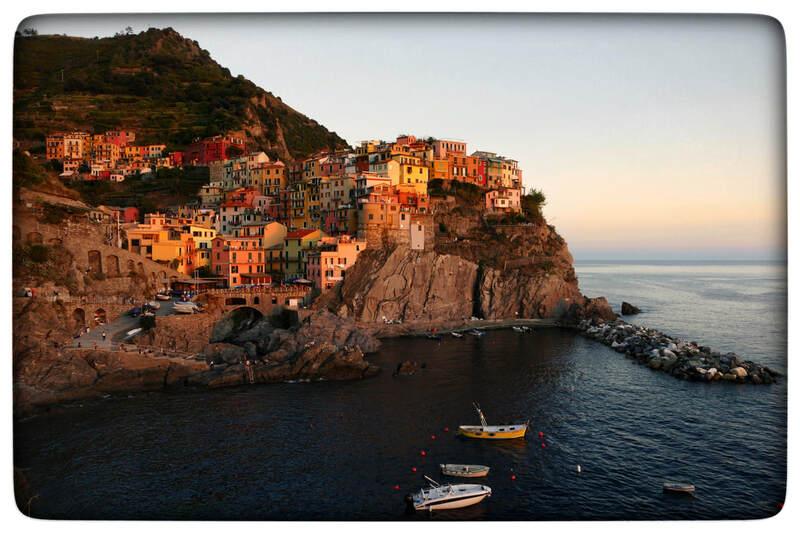 Our home base is Manarola. We are just steps away from glorious sunsets each evening and swims in the Ligurian Sea each afternoon. Several of the easier trails were wiped out the devastating flood of 2011–they may never be restored. So, first thing this morning we headed straight up through high-altitude vineyards to complete our hike to the next town of Corniglia. Our pretty little town became a tiny dot as we enjoyed the view from the terraced vineyards. Corniglia is even smaller in population than Manarola. It has a couple of claims to fame. The first one is Alberto’s Gelateria. His speciality is basil flavoured gelato that he make with basil he picks from his own garden. It is surprisingly delicious. The other is the 385 steps you have to take down to the railway station if you don’t want to hike back to Manarola. Dad’s Fitbit calculates he achieved 221 flights of stairs today with all the ups and downs. Another day in Cinque Terre tomorrow and hopefully a couple more towns. You are Always in My Prayers. Love Mom.